Instead of the usual sequel, we are getting a prequel that takes us back before the two main characters worked together at Monsters, Inc. Before they ever won the “Scare Record” or met a girl named Boo, they were students and roommates in college. Unlike their Abbott and Costello friendship in the future, Mike Wazowski (Billy Crystal) and James P. “Sully” Sullivan (John Goodman) didn’t start out that way. They were rivals, competing for ultimate supremacy in the academia of Scaring and while Mike thought that the intellectual side of the art was most important, Sully focused on his natural talents and physical dominance to advance. Although we know where these two will end-up someday, their journey and the evolution of their friendship sure will be fun to watch. This new trailer is by far the most insightful of the film’s trailers thus far as we finally get a good look at the premise of the film. While it makes the University seem like any other with parties and pranks full of jocks, nerds, cheerleaders and scary professors, the only difference is that the school is full of tentacled, winged and fanged monsters. I am excited for “Monsters University” especially since this trailer has unveiled not only the plot but also a ton of new characters as well. We get to see more teachers, students as well as alliances and enemies. Besides our two main characters returning, we will also be seeing Randall (Steve Buscemi) at the school as well. The talented voice cast is progressively larger for this second film as we have many new talented actors lending their voices to new characters such as Helen Mirren, John Krasinski, Nathan Fillion, Charlie Day, Alfred Molina, Bonnie Hunt, Frank Oz, Sean P. Hayes, Dave Foley, Joel Murray and Bobby Moynihan. While it could easily turn into typical comedy fodder there are some great moments in the trailer that really remind us of the funny dry wit or Mike Wazowski and the loving brute James P. Sullivan. The tone looks to be great and, of course, there will be a lesson or two for the kids to learn. My only reservation is the film is being directed by a first timer, Dan Scanlon, who has a background in writing and animation but has never directed a feature film. So his talents remain to be seen, but I will hold-off any reservations until seeing the end product. It does seem like a typical college and coming-of-age movie, but with the talented artists and writers I am sure there will be a surprise or two in the film and while adults are meant to enjoy the movie, it is aimed towards the younger audience and they aren’t nearly as picky as us adults. The movie looks great and I can’t wait for more of it to be revealed in the coming months before its release. What do you think of this trailer does it change your opinion on whether or not to see the movie? Leave a comment and let us know. 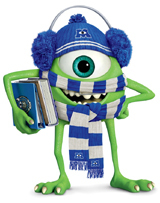 “Monsters University” will be enrolling in your local theater June 21. It will be available in 2D as well as 3D.